Damage to treads are rare and are normally limited to split or broken nosings. 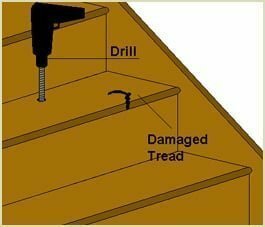 Damaged treads can be repaired or replaced based on how your staircase is constructed. 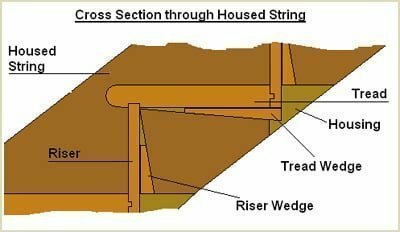 This depends on the type of string you have, either a cut string ora closed string (see staircase glossary inour information hub). Each one has a slightly different approach in removing an individual tread, they are as follows. Ideally, in this instance, the staircase will be accessible from the underside (rear). See below. In order to remove a damaged tread, the tread wedge needs to be removed first. The wedge can normally be removed by using a sharp chisel and a mallet, thhis will inevitably lead to damage to the wedges. Also, with closed string staircases, it is possible that glue blocks (triangular wooden blocks) were fitted to the joints between the tread and the riser when the staircase was constructed. These blocks, if present, will also need to be removed before the tread can be changed. 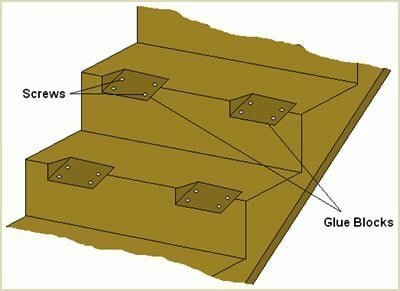 If the glue blocks are screwed into the tread and riser, then obviously these need to be unscrewed before the glue blocks can be chiselled off. With wedges, and glue blocks if any, removed from behind the tread, it should now be possible to remove the tread by hand. It may need a little prying, especially at the ends where it meets the housing of the string. 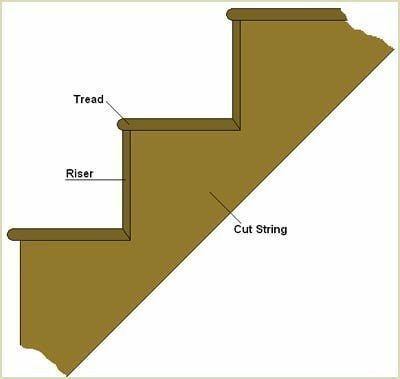 A Cut String has its risers and treads directly attached onto its outer edges and the top half of the string is cut away, see our staircase glossary. 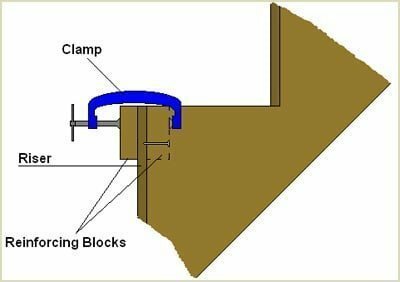 If your staircase is based upon a cut string system, you can make the replacement of the tread from above (in front) of the staircase. 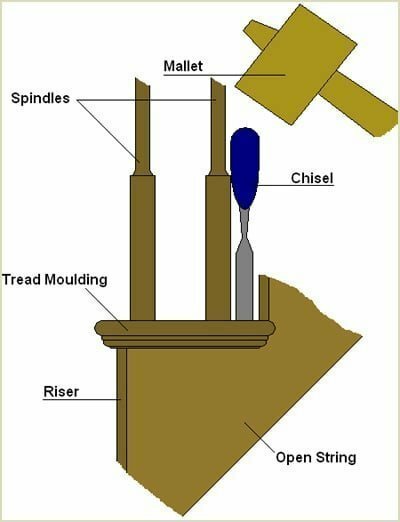 Firstly, remove the tread moulding, if any, using a chisel and mallet, taking great care not to damage or split the moulding, tread or riser. The spindles can now also be removed. 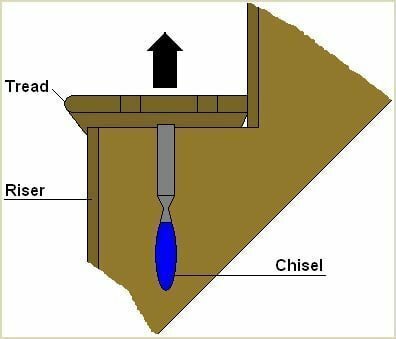 If your spindles are dowelled into the tread, and the tread doesn't have a moulding to secure the spindles, then the only way of removing the spindles from the tread is to undo them from the top where they are attached to the handrail. They can be fitted to the handrail using a few different methods, but the most common is to have the spindles fitted into the groove of the handrail with small wooden infill strips. These strips need to be removed by careful use of a sharp chisel, taking care not to damage the surrounding handrail or spindles themselves. Once the infill strips have been removed, the top of the spindles should be able to slide out. You should be able to break the adhesive bond at the base of the spindles by lifting them up and out. Some staircases have a tongued or housed type joint between the riser and the tread. This means that in order for the damaged tread to be successfully removed, this joint needs to be cut cleanly. 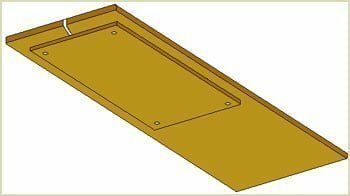 In order to do this, a hacksaw blade fitted to a padsaw needs to be inserted between these joints and cut through cleanly. 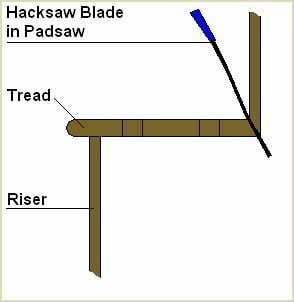 If it is difficult to thread the hacksaw blade between the joints, drill a small hole, about 3mm, into the joint between the riser and tread, then thread the blade in. Prise up the end(s) of the tread using a chisel, again taking care not to damage the tread or string. With the tread removed, glue and attach reinforcing blocks, flush into the top of the riser as shown. Apply adhesive to the reinforcing block sat behind the riser. Place the new tread onto the string as shown and screw the tread onto the string then screw the tread into the reinforcing block and the string itself. To prevent the tread from squeaking or creaking in future, it is also recommended to screw the top of the riser. 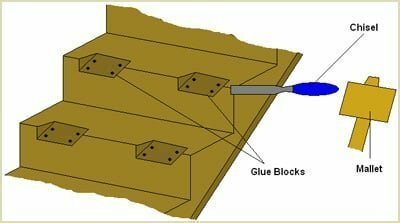 Cover the screw holes with woodplugs or filler. 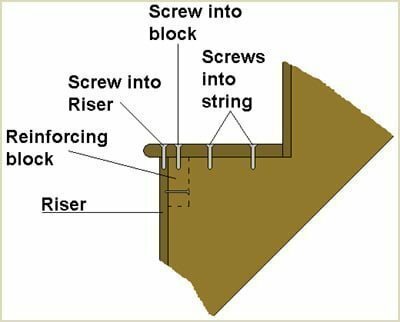 It is a good idea to add reinforcing blocks (or battens) to the inside part of the riser. The blocks act as a good anchoring point for the new tread when it is replaced. 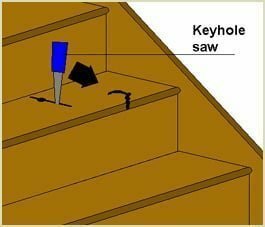 Another method of removing the tread, especially if cutting the back of the tread from the riser it is not feasible, is to drill a hole in the tread and insert a keyhole saw into the hole and cut the tread in half. On occasions, it may not be necessary to completely replace a damaged tread, but to repair it. 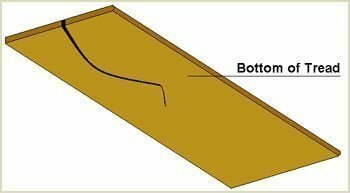 For example a "split" or "crack" can be glued and secured by used of a piece of plywood. The diagram below explains a typical repair of a split tread. Approach the repair from the bottom of the tread. Apply some adhesive into the inside of the split as shown. 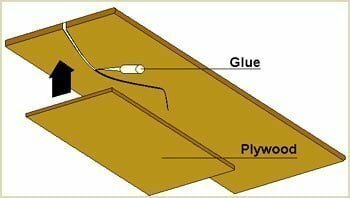 Prepare a thin piece of plywood, cut to size to cover the split. With the plywood covering the split, screw it down at the corners using wood screws, or MDF screws if the tread is made from MDF. Leave the glue in the tread to set for about 24 hours. Pear Stairs sell a number of products to finish your staircase. Remember if you have any questions don't hesitate to phone us about your staircase finish.